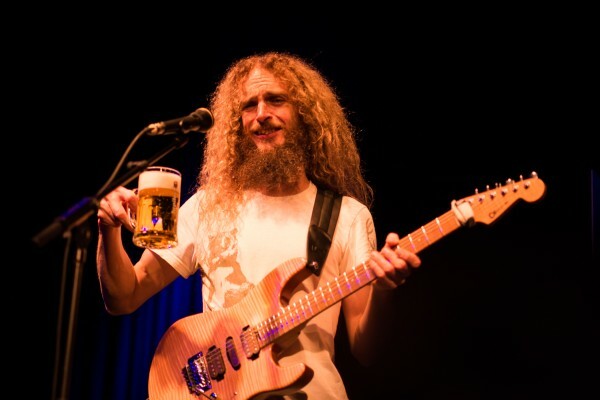 The Aristocrats are always on tour and Wednesday they entered the stage of Cultuurpodium Boerderij in Zoetermeer. Their visit was part of their world tour to promote their latest album Tres Caballeros. The venue was packed: quite a turn-up of mostly 'sweaty, middle-aged men' (not my words, but the band's), but there were some women too! 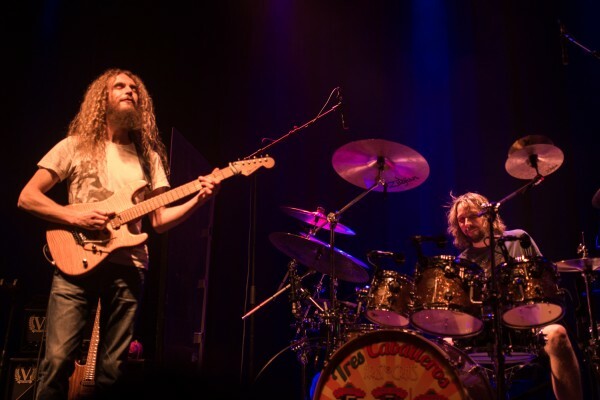 The band is a so-called supergroup, formed by British guitarist Guthrie Govan (Asia/GPS, Steven Wilson), German drummer Marco Minneman (Adrian Belew, UKZ, Steven Wilson, Joe Satriani, Necrophagist), and American bassist Bryan Beller (Steve Vai, Joe Satriani, Mike Keneally, Dethklok). These three musical nerds accidentally got to play together once, then found out they had a lot in common to work with. They formed a band, the Aristocrats, in 2011 and have produced three albums since then: The Aristocrats (2011), Culture Clash (2013), and Tres Caballeros (2015). They combine various styles, such as fusion, rock, metal, and jazz, to create a genre of their own with songs that have bizarre and intruiging titles based on funny or strange, personal experiences: nothing really deep, but very amusing. Fun is a key element in their work and performance. They pick up their instruments and want nothing more than to be under the influence of the drug that is called music. It makes them smile, and it makes the audience smile, creating one big ball of exuberance. These Tres Caballeros exchange many meaningful and elated looks of recognition and enthusiasm throughout their show. Yet they are three totally different people, which becomes all the more apparent when they open their mouth to entertain the audience with a little tale to introduce their songs. Guthrie is so very British, always polite and quite an eloquent speaker, while Beller does not shun somewhat stronger language. Minneman is kind of a chaotic and fragmentary talker. Somehow these three unique individuals really work together and have fun, and a lot of it at that. Every song was introduced by its 'creator' who explained to us the title and elaborated on the things that fuel their musical imagination. Texas Crazypants, for instance, is a song written by Beller. He once found himself in a strange situation where he was accused of running over an old woman's car in a tiny town in Texas. She went ballistic, as did all the other locals, and Beller had to pay her off to make her stop shouting and screaming and get her of his back. She took his money and then hugged him to thank him. Hence the title: Texas Crazypants. 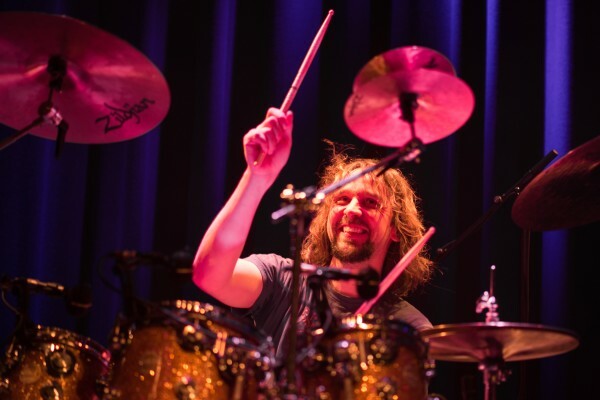 The Aristocrats have a shared passion: to explore their musical boundaries, to inspire each other with new sounds and rhythms, but first and foremost, to have fun. They captivate us with their charm and wit, then puzzle us with their astounding virtuosity performed in a seemingly effortless and nonchalant way. Quite amazing. For Smuggler's Corridor Beller requested the help of the audience for some vocal parts Guthrie refused to contribute to. It was an alternative soundtrack to a Breaking Bad-esque theme. 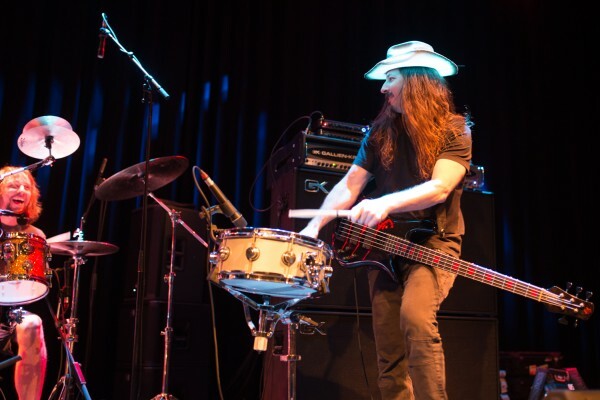 Then there was a brutal drum solo during which Minneman showed us his superhuman skills. Such stamina and drive! This particular concert was very special, not only for the audience, but the band as well, as they explained. The venue was the most packed they had seen during this tour, the audience smart, and they played a special tribute to soundman Kip, a Dutch children's song about a 'kippetje'(little hen). Soundman Kip was embaressed, yet flattered, and I could tell from the look on his face the bond between band and road crew is quite special. The Aristocrats are a band that is so grounded, bare, focused and casual at the same time, they will never get to big for their boots.